Samsung highlights, in a new ad, that you can shorten your laundry time with Samsung Quickdrive, having, thus, more time for you and the ones you love. The 30-second spot, titled “Or not”, opens with a mother watching her teenage son as he’s using this T-shirt as a towel to clean his hands after eating pizza. A voiceover says “Your parents spent 400 days of their lives doing your washing.” and adds, while on screen the respective mother, looking many years older, is seen watching her now adult son doing the laundry for his kid. “Today, you’re finally going to realize how much time they spent on you. Or not,” the voiceover adds, explaining that, now, with Samsung QuickDrive, a full clean takes half the time, a main drum and back plate rotate independently to create a unique water flow, ensuring a quicker wash at an unbeatable clean”. 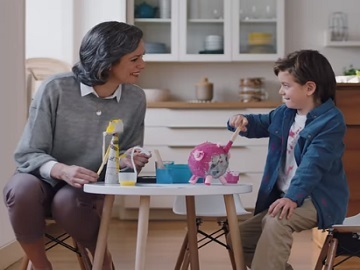 The spot, which informs that the 400 days have been calculated based on 4 times of 70 minutes laundry cycle for a week during 40 years, ends with the voiceover adding the tagline “Half the time washing. More time for you”.